Training - Deb Arnold, Ink. 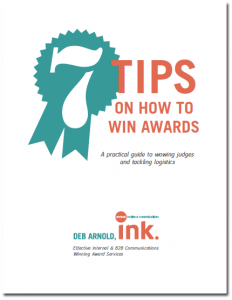 Engage Deb to bring you up to speed about awards and how to win them. Using content as customized as you need it to be, Deb can train individuals, teams or groups, live in person or virtually. Learning objectives could include: choosing the right award to apply for; mastering storytelling about learning programs; and making metrics more meaningful. Read details about Deb’s Learning Awards 101 Webinar, a helpful introduction to the world of learning awards. Read more about Deb’s award services or how she helps leaders enhance their thought leadership.